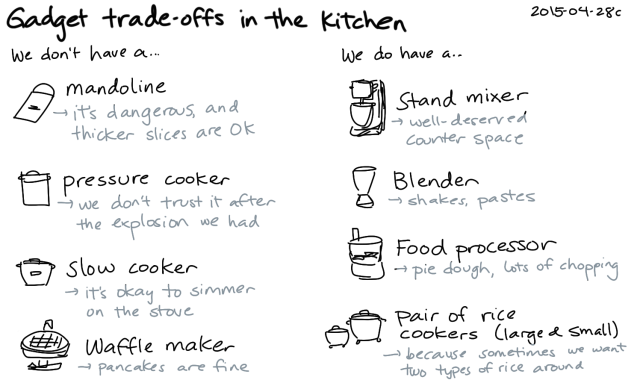 I think I spend most of my time in the kitchen: cooking, tidying up, or simply hanging out. It’s the room with the most light in the house, so it’s easy to just pull up a chair and write or draw at the kitchen table. There’s been decades of buzz around smarter kitchens – fridges that track and reorder groceries, gadgets that enable new cooking methods. Still, it’s been a little easier for me to imagine tech’s application to sewing than to cooking (at least in our household. I think it’s because we deliberately try to avoid cluttering our kitchen with the endless stream of gadgets sold in stores, on television, and now the Internet: from the “It slices! It dices! It even juliennes!” mandoline, to spiral slicers, to even workhorses like the slow cooker. Mmm. 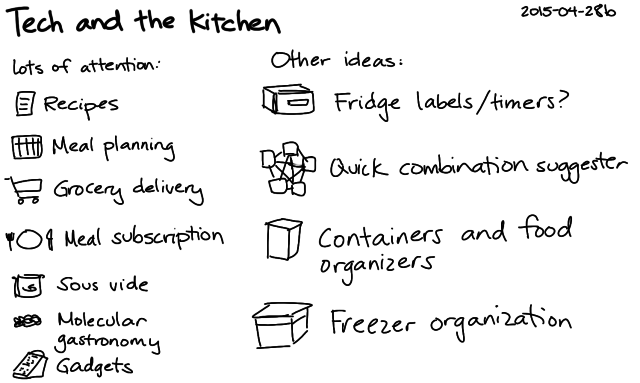 In terms of the kitchen, where do I want to explore? This might not overlap with where most of the startups are focusing on. Divergence can be quite interesting. 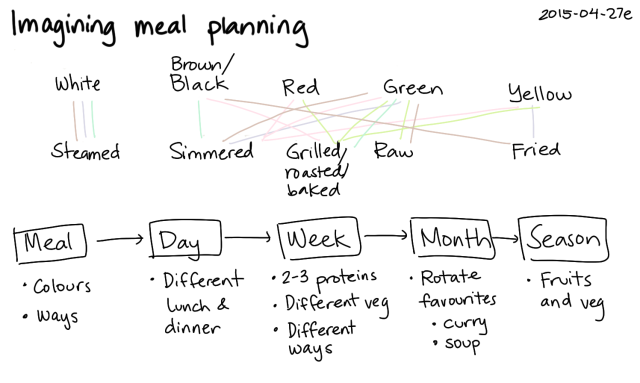 Hmm… There’s a lot of interest around meal planning, but maybe I can play with the specifics of it. I’ve been working on building more variety by focusing on five colours and five ways, following a thread I found in a few Japanese cookbooks. (And five tastes – that’s another level I want to figure out =) ) It might be interesting to graph several of our favourite combinations, and then cycle through them as I add more variety.